Since the brand’s debut in 2003, many, many Tatuaje cigars have been highly acclaimed. But few Pete Johnson creations have achieved such legendary status as the original El Triunfador. Back when the line, which is Spanish for “triumphant,” was introduced in 2008, El Triunfador only came in one size: a Lancero (7.5 x 38). The blend consisted of a Connecticut Broadleaf wrapper around binder and filler tobaccos from Nicaragua. Later, we would learn Johnson initiated this release to stake his claim to the old Cuban name, which he had registered in the U.S. He re-launched the full El Triunfador line in March 2010. 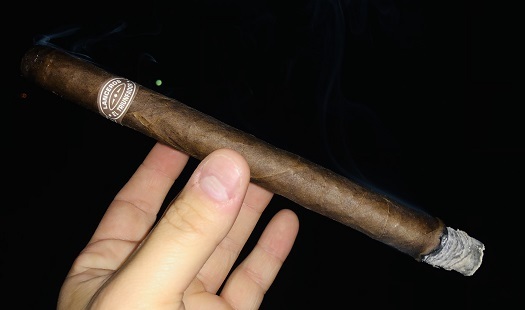 It had a different recipe (most notably, the wrapper was Habano Ecuador), a different band, and seven vitolas. It was marketed as an “Old World, medium-bodied, Cuban-style cigar.” At first, this line was only available in Europe, but it eventually came to the U.S. market. I recently came across a stash of El Triunfador Lanceros at my local tobacconist here in Chicago and picked up a handful for about $9 apiece (not including outrageous Chicago taxes). While this is the original Connecticut Broadleaf-wrapped blend, I harbor no hope that these cigars are from the 2008 production run (Johnson says he continues to have this cigar made). This long, slender Lancero has all the rustic appeal you’d expect from a Connecticut Broadleaf creation. It is dark, oily, toothy, and not without its fair share of veins, wrinkles, and thick seams. The triple-cap is adorned by a pigtail finish, and the foot exhibits pre-light notes of cocoa and sweet hay. Despite the cigar’s thin ring gauge, the cold draw is smooth. Once an even light is established, the introductory flavor is meaty, leathery, and oily with a delightful core of creamy roasted peanut. As the cigar progresses, attentive smokers will find cherry, citrus, earth, and molasses sweetness. The overall impression is of a finely balanced, well-rounded cigar with little spice and a short finish. Complexity is the name of the game. There’s a lot going on here. In addition to the flavors I’ve already mentioned, at times I find cedar, oak, leather, butter, café au lait, warm tobacco, and dried fruit. Despite the lack of spice, the body is medium, the strength (nicotine content) is fairly low, and the texture is woodsy and bready. The physical properties leave little to be desired. The three Lanceros I smoked for this review each had straight burn lines, good smoke production, clear draws, and solid ashes. If you’re a fan of Tatuaje, and if you like lanceros, this is a must-try. And even if you are neither of those, I’d still recommend firing up at least one original El Triunfador. There’s just so much to like. That’s why I’m settling on an outstanding score of four and a half stogies out of five.